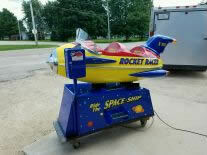 Original Bally Manufactured Coin Op Kiddie Ride Rocket. 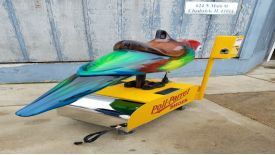 Upgraded with tall wings, chrome bullet center, sound, engine turned aluminumdash, variable speed mechanism, Cadillac lights and much more. 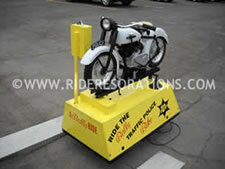 Complete restoration work performed by 'Ride Restorations'. 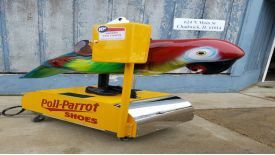 Exhibit supply 'Space Patrol Scout Ship'. 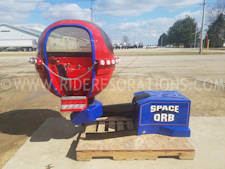 Pre-production ride built in conjunction with the TV series 'Space Patrol'. 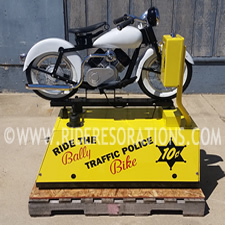 Restored in the original Ralston & Purina livery as original. 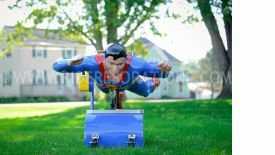 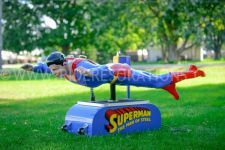 Original Flying Superman Coin Op Kiddie Ride. 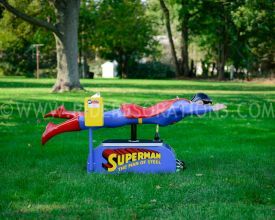 Faster than a speeding bullet, more powerful than a locomotive and able to leap tall buildings in a single bound. 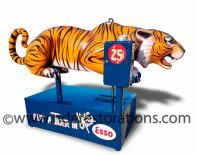 Esso Tiger Coin Operated Kiddie Ride Restoration by riderestorations.com This great cross-over item to petro and antique gas collectors is dressed very appropriately in an Esso theme. 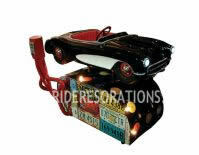 1957 Ford Fairlane 500 Coin Operated Kiddie Ride. 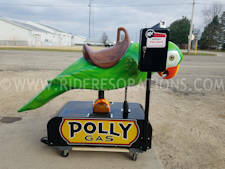 Restored coin operated parrot kiddie ride finished in 'Polly Gas' theme. 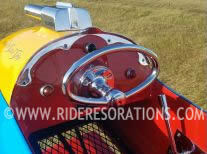 Restored Vintage Corvette Coin Operated Kiddie Ride with vintage accessories. 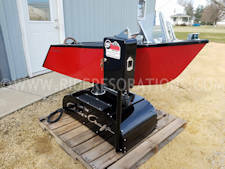 Meteor Machine Corp. from Brooklyn, NY. 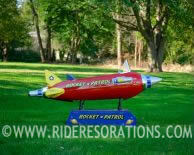 manufactured this Rocket in 1953. 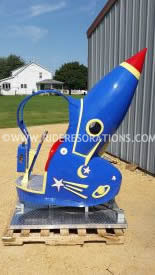 Sold as the 'Meteor Rocket'. 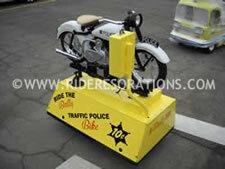 This is a complete restoration to perfection by 'Ride Restorations'. 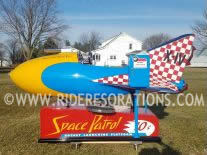 Rocket Patrol Coin Operated Kiddie Ride Restoration by Ride Restorations. 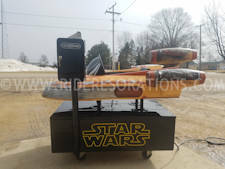 Built in 1953 using surplus WWII parts by a company in Pa. We have molds to recreate all of the exterior composite parts on this ride! 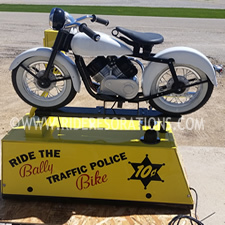 Manufactured by 'Bally' in Chicago, IL. 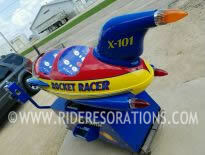 Originally a two seat coin op kiddie ride now streamlined to a more sleek single seat design by 'Ride Restorations'. 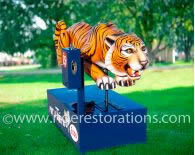 Jungle Tiger coin operated kiddie ride, restored in 'Power Lube' theme. 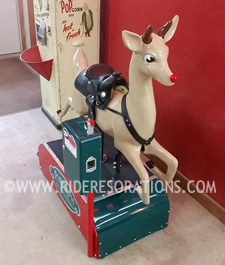 Donald the Duck coin operated kiddie ride restored to original condition. 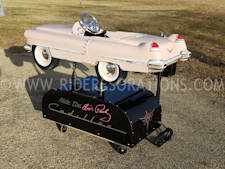 Restored 1956 Cadillac coin operated kiddie ride with custom paint, interior, and hand painted graphics. 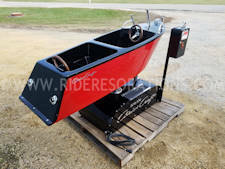 Two Seat Round Rocket with unique spinning motion and vita-ray coin box. 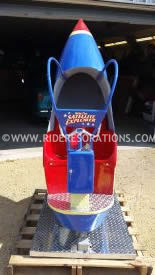 Ultra rare 'ride with Batman' restored coin op kiddy ride. 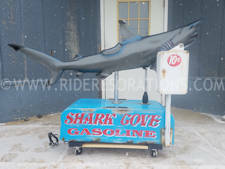 A fun experience for the rider, sitting behind batman himself. 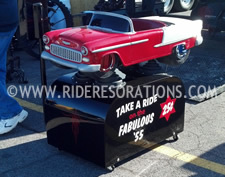 1955 Chevrolet Coin Operated Kiddy Ride Restoration by riderestorations.com We offer over a dozen vintage car body styles in this ride. 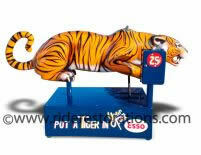 Nascar Stock Car Coin Op Kiddie Ride. 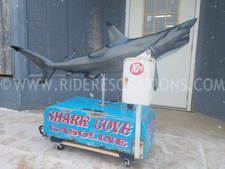 Original patina with mechanical restoration. 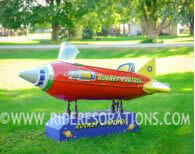 Oringailly part of a 'Coney Island' attraction that held several two place rockets that swung around on chains. 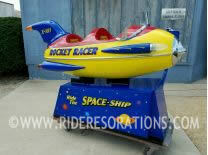 This Rocket body has been re-purposed into a Coin Op Kiddie Rid by 'Ride Restorations'. 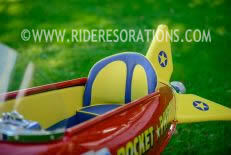 Finished in a 'fantasy' scheme as 'Rocket Racer'. 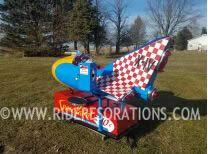 Gilmore Special #5 Midget Racer Coin Operated Kiddie Ride Restoration by Ride Restorations. 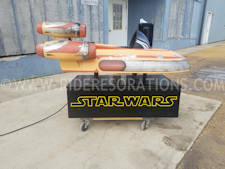 This item was severely weathered and required considerable repair before the cosmetic restoration could be done. 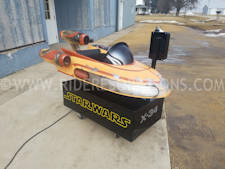 Coin Op Kiddie Ride 'Speed Queen' boat. 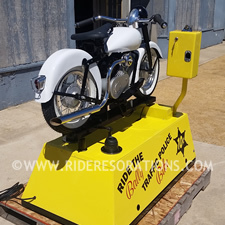 Complete restoration by 'Ride Restorations'. 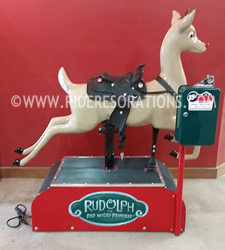 Custom Coin Operated Kiddy Ride. 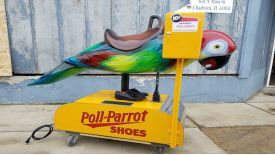 Restored parrot kiddy ride in 'Poll Parrot Shoes' livery. 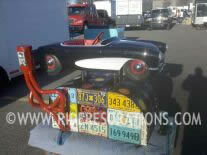 1957 Corvette Kiddie Ride with folk art motif. 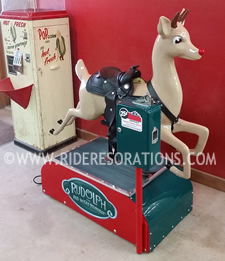 Completely a fun 'fantasy' Kiddie Ride by Ride Restorations. 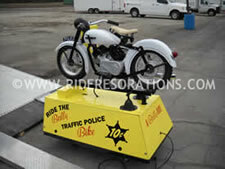 Exhaust header coin box, classic vinyl 78's and license plates on the base, window to see the motor at work. 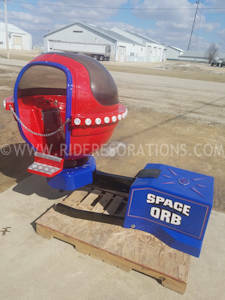 1970's Space Orb coin operated kiddie ride. 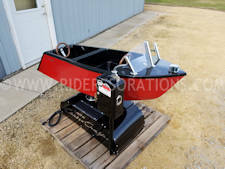 This item has a unique range of motion; the rider controls the ball to lift and spin. 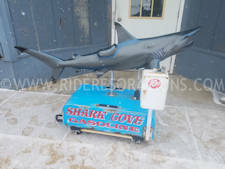 We added programable sequenced color changing LED lights for added attraction. 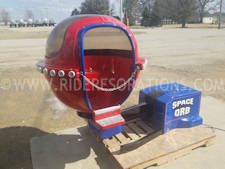 Built by 'All Tech Ind', of Fla. manufactured the 'Satellite Explorer' in 1965. 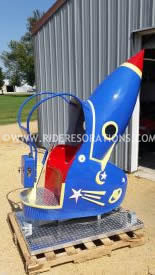 This Coin Op Kiddie Ride Rocket was complete restoration by 'Ride Restorations'. 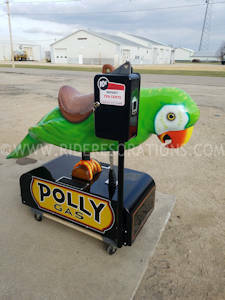 Made by Bally, Bucky has a unique motion with the body articulating like a real 'Bucking Bronco'. 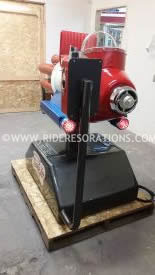 Ride Restorations performed extensive service work to the mechanism, electrical, sound, and cosmetic aspects of this ride.